The Textile Conservation Centre, or TCC, was the predecessor of the Centre for Textile Conservation and Technical Art History at the University of Glasgow. The TCC was founded by Karen Finch OBE, in 1975. From then until 1999 it was based in Hampton Court Palace. Karen Finch retired from the TCC in 1986. In 1999, following a merger with the University of Southampton, the TCC moved to a purpose-designed building on the University's Winchester campus following a major fundraising campaign by the Foundation. The University decided to close the TCC in 2009 - a decision which caused an international outcry. Three decades of work by the TCC's staff and graduates had transformed textile conservation internationally and it was felt to be vital that this work was not lost. TCC staff also raised millions of pounds for research, including the £948,000 award from the Arts and Humanities Research Council, as well as hundreds of thousands of pounds in bursaries. The TCC was rightly described by Jerry Podany, President of IIC, as 'national treasure for Britain, a national treasure on which the other national treasures depend' (The World This Weekend, BBC Radio 4, April 19th 2009). The Foundation's Trustees worked to find a future for the Centre's work and decided that Glasgow University offered by far the best home for textile conservation education and research in the UK. They were right! The TCC's successor, the Centre for Textile Conservation, has thrived as part of the University of Glasgow as you can see from this site and by following the links to find out more about the Centre's work. A student workroom at Hampton Court Palace in the early 1990s. 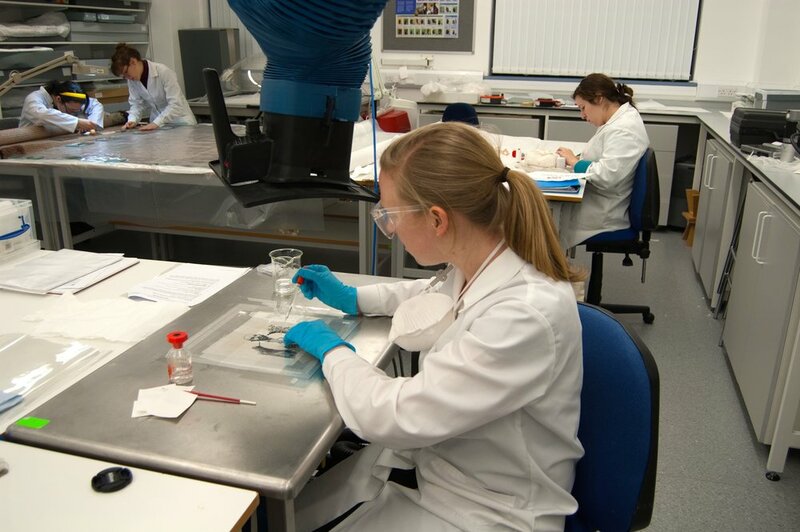 Students at work today in the Centre for Textile Conservation, University of Glasgow.